The pace of the Openreach full fibre roll-out has been picking up for some time and with the declarations in their last financial statement issued at the end of January 2019 it was always likely that the 1 million premises mark would be hit in Q1 2019 and our tracking of the roll-out can report that on the evening of 3rd April 2019 we hit a figure of 1,003,094 premises where Openreach FTTP was available to order. There has been a surge in what we have been finding since it was only 17 days ago that we had just passed the 900,000 premises mark and this is down to a surge in the amount of Fibre First areas showing live FTTP especially Northern Ireland where in the last month full fibre coverage has leapt from 90,000 premises to 128,000 premises with the increase concentrated in the Belfast area and we expect to find more. The two latest exchanges where we have seen Fibre First coverage appear for the first time are Knock (Belfast) and Colinton (Edinburgh). Hitting and passing the 1 million target is not the end of the story since in a few days under two years Openreach needs to have delivered another two million premises and if the pace seen in 2019 continues then we are expecting to see the 3 million target hit in January or February 2021. 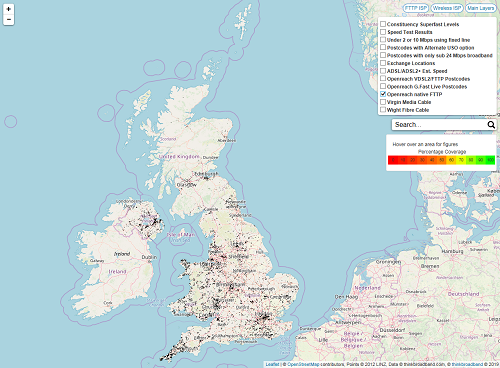 Openreach is not the only operator rolling out full fibre and another milestone was hit recently and our tracking of all the FTTP operators shows the UK footprint is at 2,047,954 premises. So Openreach contributing just under 50% of that figure means it is the largest full fibre operator and looks likely to remain so for a good number of years. The Fibre First roll-out from Openreach is concentrated into a number of exchanges and that makes tracking the coverage levels simpler and we can share our list of Fibre First exchanges and the current levels of Openreach FTTP coverage within them. This particular set of figures make no distinction between the old commercial roll-out (mainly Thornthon Heath), new build and Fibre First but does show how some areas are racing towards very high levels of full fibre availability. Premises passed means that the only component that needs installing is the final bit of fibre into the home or business, which for the Fibre First roll-out means screwing a section of pre-made fibre to the manifold on a pole or in a pavement chamber and then running this cable to the home and installing the ONT (fibre modem) with the fibre running in existing ducting or over a pole or two. The next more important step is to see people ordering and using the FTTP services and the long list of exchanges includes some very different prospects e.g. Kings Norton has almost no existing Openreach superfast options with people reliant on Virgin Media but many other areas have extensive VDSL2 coverage at superfast speeds in addition to Virgin Media and there is a few areas with no superfast option at all jumping straight to full fibre. We are seeing exchange only lines seeing FTTP arrive and cabinets previously considered non-viable for VDSL2 but as the coverage figures things are far from uniform and even in areas of an exchange that has blanket coverage there is the odd block of flats bypassed; we should add that living in flats does not preclude getting FTTP as plenty of flats are now showing with FTTP available just there are more factors involved compared to a street of terraced or semi-detached homes. @thinkbroadband What does ‘passed’ mean? 'Passed' means you can order fttp. Still the last bit of cabling needs doing but not much. Which we covered in the article below the table of Fibre First exchanges, since this question always gets asked. Any change in the connections rate (/wk) since your last update? 900,300 to 1,003,094 in 17 days, so 42,000 per week. Don't believe Openreach is deploying at that rate, but maybe at 20,000 a week versus their declared 14,000. In short we are catching up to the front edge of their roll-out. Alternatively it might mean they have continued to ramp up the pace and we will hear about that when the financials are published. Or I've got it all wrong and they'll declare less than a million premises passed. LOL.Covered all the possible bases there. So another 20 years before it come here then, not that I am that bothered. By the way the numbers are out of date already, as more is in system to add to checkers tonight. My exchange (Great Mollington - WNGM) has 22 premises that can connect using FTTP which was configured earlier this year within the Connecting Cheshire project for BDUK. Fttp now available in my area, unfortunately cost is extortionate as there are only a few Fttp providers at the moment. I will be waiting until more mainstream providers and competition are available. Cost is the same as for FTTC for the same package so not extortionate. Are you thinking of FTTPoD rather than what is talked about above. Cheapest FTTP service (55/10) on BT Retail is £31.99 pm incl line rental or £39.99 pm for the 80/20 FTTP service. Hardly eye watering prices. As the list on Openreach Website stating the exchanges that are being upgraded , the total has decreased in the last few months I feel the provision of fibre to the Post Codes from this list will be registering a higher rate from Openreach as the months pass. I feel that Openreach is not advising Thinkbroadband of the facility’s on the Post Codes ( ADSL, FTTC, pure Fibre etc ) I feel this is very important for the public and the Uk. Come on Openreach and ISP,s help Thinkbroadband and you will help everyone. The information on the Post Code ( Shop window ) is most important for selling and general information and I feel that is the key to a good service for the UK and it,s customers . Blackmamba what on Earth are you waffling on about with that word soup? This said you're the guy who thought packets were routed from cabinets to homes using post codes, and that latitude and longitude are involved. Please proof read the things you write here. They make absolutely no sense on any level beyond, I think, a request from Openreach for transparency as to the technologies available in post codes. There are checkers in place per premises for this that Openreach CPs use to provide us results. Postal code level information isn't enough for FTTP. I have no problem locating a customer which has access to Fibre or any other service by using the Post Code GPS position it’s all there on Openreach Web site with their list of Exchanges/Post Codes/Addresses. Can you show people where you can enter the latitude and longitude (which are GPS coordinates most often used) on the Openreach website to detail availability? Also where on the Openreach website is a list of postcodes and addresses? Hi Broadband Watchers. Just log in to Bt Checker then click addresses enter post code this will give addresses, Lat/Long. The Lat/Long is the exact position Of the Home. You then can cross check to goggle maps to see if the address is correct. Do the same procedure on Openreach web site this will give the address but not the GPS position and what is available. You will find on some lists the addresses are not correct and have no GPS. The best address list is Ofcom (postal). So you have a login to the BT checker, surely that should have been revoked since you retired from BT. So which page is this login on, so anyone can register, since they seem to let anyone in? Also where is the list of addresses from Ofcom to download, i.e. the 30 million+ addresses. Hi Broadband Watchers. If you us the Bt Checker with the numbers it will give you the last time the line was tested and if there are any bridge taps and if the service is ADSL or FTTC up and down speeds and date I fount this was only available in the last six months. The numbers? Do you mean telephone number? Which of course is not accurate for the millions of MPF lines across the UK. Yes it is the telephone number . Mine 0142860xxxx = Haslemere area Code. (01428). From this GPS. (12 digits) = Saffron. A telephone number has no inherent GPS information embedded in it. With number porting and VoIP it is possible that a phone number is located anywhere that an Internet connection is possible. Any links between telephone number and GPS are because of an individual provider making the link, and with MPF only the holders of those number ranges know where the number is located. The error addresses are filtered out on the Openreach address files the GPS location does not show. The number and Addresses are split thus giving the correct indenity. The correct file will be the OFCom file (list). The ISP should have the correct information on the addresses / identity to cover the data protection act if called on . So help your fellow humans by sharing a link to this Ofcom file list, so people can figure out what you are trying to say. Have no idea why the data protection act has come into things now. For those who think I am lost go to Goggle. Type in OFCom Post Checker and you will see the addresses ( List ) I have found them the most correct against Bt list, Openreach, and ISP,s. Good hunting for the Pure Fibre. So you type in a postcode and the dropdown lists addresses. Shows postcode centres, not the property location. No sign of lat/long. The Ofcom checker just repeats what the providers supply when Ofcom uses its statutory powers to request data. When correct it is generally 3 to 6 months out of date. Don't believe me SN25 2SB was introduced in Sept 2018 and Ofcom still knows nothing about it. Yes you are there. This list will have a total Addresses (Names) Say 10. Then go to the BT Checker using addresses and you will see on the address 12 digit number which is the Lat/Long and by it is the address number. To recheck use Google Maps and it will give you the name of the house and the decoded position Lat/Long. I have found that where people move they take the house name with them so you must check the Lat /Long or the name has been changed. If you then go via Openreach using the Post Code select address this will give you the Cab number and if work is pending may be pure fibre or reference to an ISP. How do these convert to the lat/lng? Hi Andrews staff. Just tracked the route back to the Alton Cab 25 using Google Post Codes Addresses that have lat/ Long plus the address identity. I checked only a few on the A335 and did not do a cross check with OFCom and Openreach lists. Where are addresses with lat/long for individual properties? The UPRN contains no attribution or information (for example coordinate position) about the property. @Blackmamba Perhaps you could answer the question, rather than throwing more word soup into the comments i.e. where is this 12 digit number that tells people the lat/lng of a property on the BT Wholesale checker? We have to ask the question, because for those not familiar with things are potentially being misled by your statements. I have tried to answer the question but you and others do not follow ( my logic ) as it only takes me a short time to get the service that is available to the Post Code at the present time. Just think what I have stated if there are any Openreach techies please attack me over transmission ( Tones ). @BM - please give a link or copy the text where the lat/long of a property is given in connection with broadband provision. The BT checker gives the UPRN, that does not give lat/long, Are you just finding the exact property on google maps for it? Hi Somerset. I have checked the list on Post Code Gu345QW and the correct one is the OFCom one. You will find the GPS number (12 digit ) on the BT Checker referring to the addresses on the Ofcom one. I did work at Alton Exchange X bar at odd times. I’ve just looked at the results using GU34 5QW with both the BT Wholesale and Openreach checkers. Oddly neither gave any indication of either the GPS data nor longitude or latitude, please specify more clearly which checker you’re referring to and, better still, post the results showing the data in question. @BM what you call the GPS number is the 12 digit Universal Property Number. Hi Somerset. Yes you are correct just one more step and you will see a 12 digit number the first 6 is the Lat and the other 6 is long. So Blackmamba are you saying you are using Google Maps to translate the address into a lat/lng for you? As I pointed out that is not always accurate, and I just picked a postcode on Alton exchange with no prior knowledge of any google error for this building. @bm Example please of UPRN being lat/long. A big hint being 'unique'. Apartments? 'What happens to the UPRN when the building is split into flats? The original building retains its UPRN and becomes a ‘parent’, individual properties within the building, known as ‘child properties’ are allocated their own UPRN. All ‘Child’ properties reference the UPRN of their ‘Parent’ property to show this ‘parent/child’ relationship. What happens when two flats/ buildings are knocked into one? Pretty sure they aren't making latitude and longitude anymore.